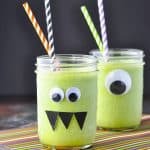 This 4-ingredient monster green smoothie is the perfect way to fuel your little ones with nourishing, wholesome foods. Fun and easy! Combine all ingredients in a high-speed blender and puree until smooth. Serve immediately and garnish with candy eyes, if desired.